We saw this post about a man and his caddy and received permission to share it here on Israel Blogger. We were walking up the Fairway at hole #4. I was walking next to him when he uttered those words to me. My opponent was walking ahead of me. More often than not, his words have meaning. You have to search for the kernel of truth in between the volume of words — but often times the sentences, carry weight. It was a Thursday morning in July. About 8am. I invited a big client of mine to a club I belong to. The golf game was planned as a way for us to have a working session. Golf was second. Developing our relationship was primary. As far as I am concerned, riding in a golf cart is not consistent with playing golf. Walking a course, feeling the terrain, and enjoying a course, is as important as playing the course itself. Comfortable golf shoes are a must. I’d rather do something else (and not play) if I have to ride in a golf cart. I’ve been blessed enough to enjoy the company of Caddie’s the last few years of my golfing life. The cast of characters that make up my interactions with Caddie’s is long, the stories of each Caddie’s life is both, endless and interesting –– but their wisdom is often, FAR GREATER THAN THEIR OCCUPATION. Anyone who is a good Caddie, not only understands golf — they understand life. I learned that on this particular morning in July. I stopped. We were only on the 4th hole, yet his words stung me like a knife to my heart. And then, I started noticing things that I had missed on the first 3 holes of our match. The clients scoring was off. He scored a 6 on the next hole — and he told the Caddy who was keeping the score, that he got a 5. 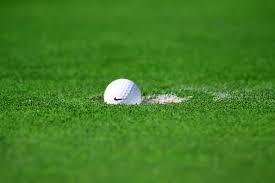 He did not replace his divots on the green. Nor did he would hit a shot onto the green, and then walk casually by the hole in the ground — (and damage to the course) as he marked his putt. He never said “Thank You” to the Caddie as he was handed his putter. And he moved a ball slightly to give it a better position in the rough, when he thought I was not looking. He was rude and condescending to the Caddy who was walking with us. My steady partner who I spend many hours with nearly every weekend — he was rude to someone who was carrying his bag, and mine. He was my guest, and I was embarrassed. If you are rude to a waiter, a Caddie or anyone who is working — and I see it happening — it is virtually a guarantee that I won’t be around you again,EVER. I’m allergic to rude people. I get sick when a person I am associated with mistreats, or “brushes off” those who are working for them — in any capacity. My client showed none of it that day, and I was sick to my stomach when I thought about it. I played out the rest of the match, and never said a word to the Caddie about it…….until yesterday. As we got ready at 7am, I pulled him aside. He proceeded to teach me something I did not know. The client is no longer a client. As soon as a problem came up, instead of me fighting for his business, and SELLING MYSELF to keep him onboard — I cut bait, and let him take his business to a competitor. The Caddie is still my Caddie. He is a funny, great, and true gentleman through and through. I learn more from my Caddies, (who dont have MBA’s, College Education’s, or big titles) — than I learn from some of my peers, and some colleagues. I don’t care where it comes from. But, when it comes from the golf course, and some amazing Caddies who teach me about life — even better.